IPSC or IDPA? Who you are and what you want will influence which is best for you. 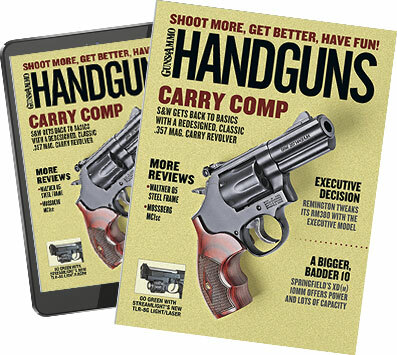 You're a new handgun owner or newly in possession of your concealed pistol license. Or you've owned and shot handguns for a long time, but you've done the "go to the range" thing--standing in one spot while shooting holes in paper targets--so much it's getting to be a bore. You've seen club match notices posted on the range bulletin board, and you're trying to figure out which one to try. IPSC (International Practical Shooting Confederation) and IDPA (International Defensive Pistol Association) are both handgun competitions involving drawing, movement and decision-making. IPSC (run here in the good ol' USA by the USPSA) is the older of the two. IDPA split off from it almost 15 years ago over differences in equipment and approach--differences that from this distance appear to matter about as much as what caused the French to go after the Albigensians a couple of centuries ago. What you, the gentle reader who is considering taking up something more interesting than plinking, want to know is this: Which will be better for me? First question: How competitive are you? If you sold your dirt bike because your doctor told you it was the only way to keep your knees, but you still miss the adrenaline rush, you're an IPSC shooter. Don't get me wrong; there are a lot of competitors at USPSA/IPSC matches who are just there to have a good time. But scratch them even a little bit, and they are competitive. Things like having to buy a round of soft drinks for the squad for hitting a no-shoot target, or carrying a stuffed bunny rabbit for being the lowest-scoring shooter in a group are common at some clubs. The top shooters, while all being nice guys and gals, are competitive to a degree that might alarm you, depending on your shooting/athletic background. How competitive? Take me as an example. I don't play board games with the nieces and nephews. Why? Who wants to win a million fake dollars at a board game and not have the relatives talk to you for raking little Jenny over the coals for rent because she landed on my property? I don't play "for fun," and neither do the guys who beat me at matches. I know shooters who routinely bet a dollar on things like most "C" hits or extra reloads. They'll happily trade the same dollar back and forth at a match. A lot of IDPA shooters don't care who wins or who they beat or get beaten by. All they care about is checking the state of their shooting skills. Skills being maintained or improving? Fine. Skills slipping a bit? Must practice. The difference comes from the design approach. Think of it in terms of figure skating: USPSA/IPSC is freestyle, and IDPA is compulsories. In the former, you are presented with a stage. You have limits, mostly for safety, as to what you can and cannot do. After that, you're on your own. In IDPA, the stage is often choreographed for you. "Start here, go there, stop here, carry this." And your reloads, movements, shooting positions and corrections are all mandated by the stage procedure or the rules. People shoot IDPA because they want to be better-skilled with the gun they used in the match. If you see a very competitive shooter at an IDPA match, he's probably dropping by between his USPSA/IPSC matches. "But USPSA/IPSC is a game, and IDPA is training" someone will say. Pardon me while I clean up the coffee I snorted through my nose. Is there a timer? Check. A score sheet? Check. A rule book, one not based on state law? Check. Then it is a competition. USPSA/IPSC tends to be more austere, where buildings and obstructions tend to be more conceptual than real. I know people who actually do kick down doors for a living, and they don't view either of these as tactical training. As one of them put it: "Patrick, I go to USPSA matches for the same reason I go to aerobics classes: It is fun, and I keep my basic skills up." Training was the work he did that followed departmental regs and state law exactly--not a stage designed by some guy who dreamt up the scenario the night before. He goes to aerobics because the classes aren't filled with big lugs like himself, and he shoots competitively to stretch his skills. You see, while neither are training, neither are bound by the constraints of training. Handgun head shots at 25 yards? On the street that is a desperation move; time has run out, and the SWAT team isn't there yet. But you can pose it as a problem in a match and let people test their skills. The attitude toward stage design and approach is important, and you must keep it firmly in mind. In a USPSA/IPSC match, you will rarely shoot a stage where the details are laid out for you. Stage designers there pride themselves on sparse stage descriptions. You'll be told the start position, and told not to do anything unsafe, while you "engage the targets as they become visible." Where you shoot them from, as long as you are safe while doing so, is your choice. In an IDPA match, the stage description will tell you what targets you can shoot from where and in what order. Mess up the order and you'll be penalized. Try too hard to work around the description and you'll be whacked with a "nuclear" penalty: the Failure To Do Right. Which leads us to scoring and shooting pace. In USPSA/IPSC, you shoot the targets, they total your score and divide it by your time. In IDPA, every hit outside of the target center adds time to your run. Your score is your total time: shooting plus penalty time. The "USPSA/IPSC is gonna get you killed" crowd will tell you that no one aims in IPSC, and that spraying fast is the way to win. The truth is, you have to shoot accurately in either game to win. It has been more than 20 years since anyone could spray hits all over the targets and still expect to win a USPSA/IPSC match. In both sports, the winners will be shooting about 90 percent center or "A" hits. Second question: Is your firearm a tool or is it a precious object you fuss over, obsess about, improve and decorate? Tool-minded shooters fall mostly in the IDPA camp. USPSA/IPSC shooters are a lot more into the "extreme" attitude toward a sporting event or competition. Having already spent $2,000 on a handgun, they'll gladly spring for another couple of hundred bucks to have it chromed and splatter-painted in four eye-searing colors. They'll experiment on magazines to get one more round to fit. USPSA/IPSC shooters take pride in dressing like color-blind superheroes, with alarmingly hued shirts and pants decorated with manufacturers' logos. Purple shirt, green shorts and red running shoes? Check. USPSA/IPSC shooter. IDPA shooters take pride in spending as little on a gun as possible, except for those shooting one or another 1911 variant. And, there, the task seems to be to spend as much as possible without it being noticed. Vest? Check. Jeans? Check. Sensible shoes? Check. IDPA shooter? You betcha. Where USPSA/IPSC shooters all seem to be shouting to be noticed, IDPA shooters strive to go unnoticed. Except, social conventions being what they are, the "unnoticed" have adopted a uniform that borders on cliché. Sturdy shoes, khaki pants, polo shirt and photographer's vest (but no camera)? IDPA shooter. The inside joke is that they all wear their personal "shoot me first" vest. Now, in some locales grown men who aren't actual photographers wear photographer's vests and go unnoticed. But most places, even people who don't know about concealed carry guns or IDPA are going to look at you. Me, I'm a maverick, which means I don't fit either scene I've just painted for you. I shoot both games with a revolver, and it's difficult to "bling" up a revolver. I shoot USPSA/IPSC with a blued S&W 25-2 in .45 ACP. There, I wear a plain polo shirt, khaki pants and boots. I'm an unremarkable blot on the colorful IPSC landscape. In IDPA, I shoot a nickeled S&W Model 19, about as gaudy a gun as you can get without dropping a bundle on engraving (which I have considered.) Vest? No vest. I wear a Harris tweed jacket over a plain shirt, with Dockers and boat shoes. Truth be told, you could shoot either with just about any kind of clothing you wanted to. I think the range officers or safety officers of either would be disapproving if you showed up in shorts and shower shoes, but not because of your shocking lack of sartorial splendor. They'd be worried for your safety. Hot brass burns, and most ranges have gravel. Curiously, when it comes to stage decoration, the two switch sides. If the club budget and stage designers' energy are up to the task, an IDPA stage will be dressed to the nines. Windows will have curtains, rooms will have furniture, walls will be painted or wall-papered, and I've even seen bookshelves with books in them. At a USPSA/IPSC match, stage décor is not just Spartan but almost abstract. A "wall" may be nothing more than a frame with some mesh stretched over it. The idea is to block your vision and create something you have to maneuver around. Once the frame is up and the mesh attached, it serves its purpose, and no one expects more. In USPSA/IPSC, doors are recognizable because they have hinges and a handle. At an IDPA match, the door might have a doorbell next to it an address on the wall, a mailbox and so forth (and there may even be mail in the mailbox). USPSA/IPSC shooters consider such stuff fripperies, non-essential to the task at hand: beating everyone else on that stage. When you step onto an IPSC stage, you might be a bit disappointed by the apparent lack of props. As long as the props that are there make the shooting challenge more interesting, the IPSC shooters are happy. For them, the fun is in the challenge. There's also the little matter of ammo. IDPA rules prohibit any stage being more than 18 rounds. USPSA/IPSC shooters love big stages. You can go to a good-sized club IDPA match and not shoot 100 rounds. You can go to an IPSC match and shoot nearly 200. If you like to shoot a lot, that's a clue. So which one is for you? If the info I've given you hasn't made it clear, there's an easy answer: Try them both. Most locales that have one have the other as well.